Stumbling upon interesting items is one of the joys of working with any collection. The other day I was looking at Carl H. Claudy's The Masonic Service Association of the United States, published in 1939 [Call no. : 43.C615 1939]. While browsing through the book I came across the word "Masoniscope." What is this? I thought. It turns out that the Masoniscope is one in a long line of methods used to illustrate the emblems of Freemasonry in the lodge room. Tracing boards, whether in the form of a painting on wood or an image projected on a wall, are essentially visual aids which use Masonic symbols to illustrate the principles taught in each Degree of Freemasonry. They are used by the lecturer to help a candidate associate an image with an idea. "Later in its history the Association developed the Masoniscope; a small projector using a short roll of standard motion picture film, on which are the emblems of the three degrees. This was intended to take the place of the much more cumbersome projection lantern and the expensive and breakable glass slides." The Masoniscope was a filmstrip projector, used in this case for projecting Masonic emblems in the lodge room. Compared to the lantern slide projectors that they were replacing, filmstrip projectors were a new technology and offered advantages to the technology that they were taking the place of. You probably won't be surprised to learn that many Masonic lodges today use PowerPoint in the same way that the Masoniscope was used in 1926. And just one last thing, which shows again how much times have changed in terms of technology. 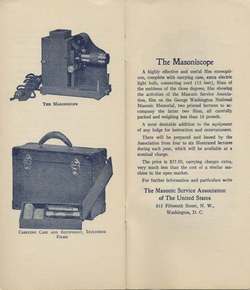 The April 1926 Short Talk Bulletin (still published by the MSA), called "Seeing," describes the Masoniscope in further detail, including a statement on how the Masoniscope was powered. I was struck by what a difference eighty years makes, since it states that the Masoniscope "uses any sort of electric current: alternating, direct, Delco, storage battery, even automobile battery current." Yes, that's right, even automobile battery current.